Good design isn't about making things intuitive; it's about making them idiot proof. It should be "intuitive" that if you have a large sharp spinning blade, you should keep your hands as far away from the blade as possible. following this logic, it's hard to understand how people didn't understand this and instead cut off parts of their fingers when using a circular saw. After you have this happen a few hundred times every year, you wise up to the fact that intuition is not enough. It's better to put a guard around the blade to encourage keep their hands away. In the real world, this is called making it "idiot proof". This is no easy task, because "idiots" are determined to do whatever they want regardless of the consequences. They will move the guard out of the way or completely remove it from a circular saw. They do this not because they really are idiots (at least we hope not), but because what good is a sharp spinning blade if a guard is blocking me from cutting something. Guards are completely counter-intuitive to the process of cutting. Here is were good design comes in to make the guard move up as the wood goes in, thereby allowing for both cutting and some protection. An even better design would have the wood automatically feed in with no need for fingers to get close. The original Apple iPod was not all that intuitive. Maybe the scroll wheel made sense to search up or down through your list of songs, but an up and down button would have made as much sense. The iPod and most other Apple products are designed around making them "idiot proof". They have guards to keep their users from cutting their fingers off. This is evident from the fact that there is no delete button or any combination of buttons you can push to accidentally delete a song from your iPod. Many times I wish it did. I'm too lazy to check through my song lists at my computer to make sure some dogs don't make it on the list. But when I'm listening to my iPod and want to delete a bad pick, I can't. Apple designers asked a simple question: Is it better to allow for song deletion if you can then accidentally delete song(s) you like, or is it better to block any deletion? Their answer was simple: "Let's make it idiot proof". Let's imagine a phone support call in the alternate reality where Apple added a grey delete button. Support: How may I help you today? 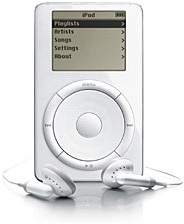 User: I lost all the music from my iPod, and I want it restored. S. Did you push the grey button on the side labeled "delete"? U: Yes, but it was an accident. S: Did you see the message that said push it again to proceed or push the middle one to stop? U: Yes, but I didn't understand what it was saying, and I don't know where the middle one is. S: Did you push the delete button twice? U: Yes, but I was confused, and now I want the song back. S: You cannot restore it. You have to reload it from you computer after deleting it. U: Why not? I didn't want it deleted in the first place! S: We understand, but that is what the delete button does. And that is why it asked you to confirm. A few thousand calls like this would really raise the cost of supporting the iPod. It's far cheaper and more "idiot proof" to prevent all deletion. The added bonus is that I can play with the buttons on the iPod all I want to and never screw anything up too bad. Yes, I can set the volume to loud and ruin my hearing, but people complained about that not being "idiot proof", and Apple had to fix that too. Apple does a great job of making things easy to use while at the same time protecting us from the spinning blades. This is a great feat of engineering, but it's not always intuitive. We'll look at some of the other ways that shows how Apple "gets it" in their design in our next article. Until then, keep your finger safe from spinning blades.